On Friday at its annual Blizzcon event, Activision Blizzard announced "Diablo Immortal," the first iteration of the Diablo series to come to mobile devices, including the iPhone and iPad. The plot of the action-RPG is set between Diablo II and III, when the Worldstone has been shattered but Skarn is still collecting the shards needed to revive Diablo, who reigns over the Realm of Terror in the Burning Hells. Footage so far shows the game playing mostly like Diablo III, but with a mobile-optimized interface, and a multiplayer world in which players can meet at public hubs to team up or simply share items. Blizzard has created six character classes: barbarian, wizard, demon hunter, monk, crusader, and necromancer. There are also new abilities and realms, including some that play on the game's isometric perspective with moving platforms and vertical movement. Dungeons are instanced like "World of Warcraft," and support up to four people at at time. The company has yet to say whether it might allow player-versus-player combat. Blizzard didn't immediately offer a release date, pricing, or required specifications. I presume it will be sold on the Apple App Store. Will the same game also be available on other platforms (macOS, Windows, etc.) and through which stores will those versions be sold? I’m hoping it won’t be a keep paying to keep playing scheme. That has been the cash cow for Blizzard for many years now. It is also where Apple appears to be pushing for—subscription model. I would welcome this if not for one thing. Where the hell is witch doctor? This is strictly for iOS & Android. There is no Mac or Windows version. It’s a mobile title that is more Diablo in looks than it is in gameplay. It will be ok, but based off gameplay videos and some reviews with people who have had hands on time with it, it’s not a true Diablo game. 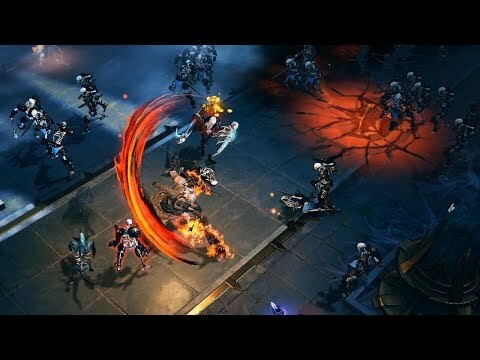 If you want true Diablo gameplay on the go, grab Diablo 3 on Switch. It will be worlds better (for traditional Diablo series lovers). The number of AAA games coming to mobile recently is an underreported phenomenon. And yet ... Civ VI, and most other premium games like it, are not subscription. Oops. This game was made by the Chinese game company NetEase and is a reskin of their game Crusaders of Light they released in 2017. If apple products are as powerful as apple keeps saying they are blizzard should of ported diablo 3. Diablo 3 was running on game consoles over a decade old. Should of been no issue. That's the claim, but it sounds like internet conspiracy nonsense. "Reskin" would mean that all of the character models and environments were identical but with different textures applied. I truly doubt that would be acceptable to Blizzard. "That's the claim, but it sounds like internet conspiracy nonsense. "Reskin" would mean that all of the character models and environments were identical but with different textures applied. I truly doubt that would be acceptable to Blizzard. " reskin means same game engine and gameplay but with new 3D models and textures for characters and backgrounds. I truly think it's acceptable for Blizzard, if they partnered with another studio for development. In the presentation, they insisted a lot on the movement UI. I don't know "Crusaders of Light" (never played it), so I guess it's a good way to see if it's just a reskin or not.